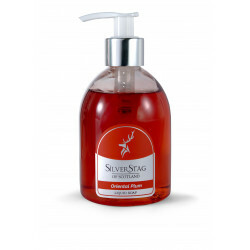 Handmade in Scotland, this luxurious scented liquid soap has a delicate fruity fragrance with a subtle hint of oriental spices. - Royal Mail 1st Class £3.40, 1-3 days including Saturdays. - Royal Mail Signed For® 1st Class £4.45, 1-3 days including Saturdays. - Royal Mail Special Delivery Guaranteed® - Next Day Delivery £8.55 next day on orders placed before 12pm. - myHermes Standard Delivery £2.79, 3-5 days including Saturdays. - myHermes Signed For £3.59, 3-5 days including Saturdays. - Free UK Delivery on orders over £100. We want you to be happy with your product and are happy to accept returns if you are not satisfied with your purchase. If you are going to be making a return, please do so within 7 days of receiving your order. Deductions for postage will be made unless you are returning a faulty item. PLEASE NOTE: We require all items below £50 are sent back by recorded delivery and all items above £50 are sent back by special delivery. We do not take any responsibility for items that are not delivered and request that you contact Royal Mail directly. Please contact us if you are returning your order, by email at customer.services@silverstag.scot or in your account panel here.